ناصرخانی, فائزه, مهدی زاده, رحیمه. (1396). پاسخ حاد برخی عوامل همودینامیک به پیاده روی روی تردمیل با محدودیت جریان خون در دختران جوان غیرفعال. پژوهش های فیزیولوژی و مدیریت در ورزش, 9(4), 43-53. فائزه ناصرخانی; رحیمه مهدی زاده. "پاسخ حاد برخی عوامل همودینامیک به پیاده روی روی تردمیل با محدودیت جریان خون در دختران جوان غیرفعال". پژوهش های فیزیولوژی و مدیریت در ورزش, 9, 4, 1396, 43-53. ناصرخانی, فائزه, مهدی زاده, رحیمه. (1396). 'پاسخ حاد برخی عوامل همودینامیک به پیاده روی روی تردمیل با محدودیت جریان خون در دختران جوان غیرفعال', پژوهش های فیزیولوژی و مدیریت در ورزش, 9(4), pp. 43-53. ناصرخانی, فائزه, مهدی زاده, رحیمه. پاسخ حاد برخی عوامل همودینامیک به پیاده روی روی تردمیل با محدودیت جریان خون در دختران جوان غیرفعال. پژوهش های فیزیولوژی و مدیریت در ورزش, 1396; 9(4): 43-53. 1کارشناس ارشد فیزیولوژی ورزش، دانشکد تربیت بدنی و علوم ورزشی، دانشگاه صنعتی شاهرود، شاهرود، ایران. 2دانشیار فیزیولوژی ورزش، دانشکد تربیت بدنی و علوم ورزشی، دانشگاه صنعتی شاهرود، شاهرود، ایران. برای تجزیه‌وتحلیل داده­ها از ANOVA استفاده شد. سطح معنا­داری آماری 05/0 P<تعیین شد. تحلیل داده­ها نشان داد هر دو برنامۀ ورزشی موجب افزایش معنا­دار HR، SBP و RPP در مقایسه با مقادیر پیش از تمرین شد (05/0P<). پس از یک جلسه ورزش، بینRPP ، HR و SBP سه گروه تفاوت معناداری مشاهده شد (05/0P<) و میزان افزایش در گروه BFR بیشتر از گروه بدون BFR بود. این در حالی است که بین مقادیر DBPو MAP در گروه­های مختلف پس از یک جلسه راه رفتن روی تردمیل با BFR تفاوت معناداری وجود نداشت (05/0P>). نتایج نشان داد BFR موجب تغییر برخی عوامل همودینامیک می­شود؛ که بیانگر افزایش نیازهای عضلۀ قلب در پاسخ به ورزش BFRاست. 2 minutes with one minute of rest between each set), 2-walking on a treadmill without BFR (with the same volume of BFR group) and 3-control (with BFR and without exercise). The heart rate (HR), systolic blood pressure (SBP), diastolic blood pressure (DBP), mean arterial pressure (MAP) and rate pressure product (RPP) were measured before and 20 minutes after the session. For blood flow restriction, Tourniquet device was used. MAP was calculated using the following formula for each person: MAP = (DBP+0.33(SBP-DBP)). Data were analyzed by ANOVA test. Level of statistical significance was set at P˂0.05. The results showed that both BFR and non-BFR exercises increased HR, SBP, RPP significantly compared with pre-exercise amounts (P˂0.05). After one session of exercise, a significant difference was observed in RPR, HR and SBP among the three groups (P˂0.05). This increase was greater in BFR group than without BFR group while there was no significant difference in MAP and DBP among different groups after a session of walking on the treadmill with BFR (P>0.05). The results showed that BFR changes some hemodynamic parameters which shows that the heart muscle needs increase in response to BFR exercises. Abe, T., Sakamaki, M., Fujita, S., et al. (2010). “Effects of low-intensity walk training with restricted leg blood flow on muscle strength and aerobic capacity in older adults”. J Geriatr Phys Ther; 33(1): 34-40. Akdur, H., Yigit, Z., Arabaci, O., et al. (2002). “Comparison of cardiovascular responses to isometric and isotonic exercise tests in chronic atrial fibrillation”. Jpn Heart J; 43(6): 621-29. Almeida, WS., Lima, LCJ., Cunha, RR., Simoes, HG., et al. (2010). “Post-exercise blood pressure responses to cycle and arm-cranking”. Med Sci Sport Exerc: 74-80. Christopher, AF., Loenneke, JP., Rossow, LM., et al. (2012). “Methodological considerations for blood flow restricted resistance exercise”. Journal of Trainology; 1(3): 14-22. Fleck, S., Kraemer, WJ,. (2004). “Resistance training andexercise prescription”. In:Fleck SJ, Kraemer WJ,Editors. Designing resistance training programs. Champaign: Human Kinetics.. 179-181. Ghiasy, A,. (2011). “On blood pressure, heart rate and myocardial oxygen cost of resistive activities upper extremities,lower extremities and whole body”. MS Thes Univ Guilan: 23-96. Huggett, DL., Elliott, ID., Overend, TJ., et al. (2004). “Comparison of heart-rate and blood-pressure increases during isokinetic eccentric versus isometric exercise in older adults”. Journal of Aging and Physical Activity; 12(2): 157. Karabulut, M., Abe, T., Sato, Y., et al. (2010). “The effects of low intensity resistance training with vascular restriction on leg muscle strength in older men”. Eur J Appl Physiol; 108(1): 147-155. Macdonald, JR. (2002). “Potential causes, mechanisms, and implicat ons of post exercise hypotension”. Journal of Human Hypertension; 16: 225-236. Manini, TM., Clark, BC. ( 2009). “Blood flow restricted exercise and skeletal muscle health”. Exerc Sport Sci Rev; 37(2): 78-85. Okamoto, T., Masuhara, M., Ikuta, K. (2006). “Cardiovascular responses induced during high‐intensity eccentric and concentric isokinetic muscle contraction in healthy young adults”. Clinical Physiology and Functional Imaging; 26(1): 39-44. Otsuki, T., Maeda, S., Iemitsu, M.,et al. (2007). “Vascular endothelium-derived factors and arterial stiffness in strength- and endurance-trained men”. Am J Physiol Heart Circ Physiol; 292(2): 786-791. Overend, TJ., Versteegh, ThH., Thompson, E.,et al. (2000(. “Cardiovascular stress associated with concentric and eccentric isokinetic exercise in young and olderadults”. The Journals of Gerontology Series A: Biological Sciences and Medical Sciences، 55(4): 177-82. Ozaki, H., Miyachi, M., Nakajima, T.,et al. (2011). “Effects of 10 weeks walk training with leg blood flow reduction on carotid arterial compliance and muscle size in the elderly adults”. Angiology; 62(1): 81-86. Ozaki, H., Sakamaki, M., Yasuda, T, et al. (2011). “Increases in thigh muscle volume and strength by walk training with leg blood flow reduction in older participants”. J Gerontol A Biol Sci Med Sci; 66(3): 257-263. Ozaki, H., Yasuda, T., Ogasawara, R., (2013). “Effects of high-intensity and blood flow-restricted low-intensity resistance training on carotid arterial compliance: role of blood pressure during training sessions”. Eur J Appl Physiol; 113(1): 167-74. Palmer, PES. “Manual of diagnostic ultrasound. First edition, Geneva WHO”. (1995). 49-51. Petruzzello, SJ., Landers, DM., Hatfield, BD., et al. (1991). “A metaanalysis on the anxiety-reducing effects of acute and chronic exercise”. Int J Sports Med; 11(5): 143-82. Polito, MD., Farinatti, PTV. (2006). “Blood pressure behavior after counter resistance exercise: a systematic review on determining variables and possible mechanism”. Int J Sport Med: 345-350. Renzi, CP., Tanaka, H., Sugawara, J. (2010). “Effects of Leg Blood Flow Restriction during Walking on Cardiovascular Function”. Med Sci Sports Exerc; 42(4): 726-732. Rossow, LM., Fahs, Ch. A., Sherk, VD., et al. (2011). “The effect of acute blood-flow-restricted resistance exercise on postexercise blood pressure”. Clin Physiol Funct Imaging; 31: 429-434. Sesso, HD., Stampfer, MJ., Rosner, B., et al. (2000). “Systolic and diastolic blood pressure, pulse pressure, and mean arterial pressure as predictors of cardiovascular disease risk in Men”. Hypertension; 36(5): 801-7. Sowmya, R., Gupta, MKNR,. (2009). “Cardiovascular autonomic responses to whole body isotonic exercise in normotensive healthy young adult males with parental history of hypertension”. Indian J Physiol Pharmacol; 54(1): 37-44. Takano, H., Morita, T., Iida, H., et al. (2005). “Hemodynamic and hormonal responses to a short-term low-intensity resistance exercise with the reduction of muscle blood flow”. Eur J Appl Physiol; 95: 65-73. 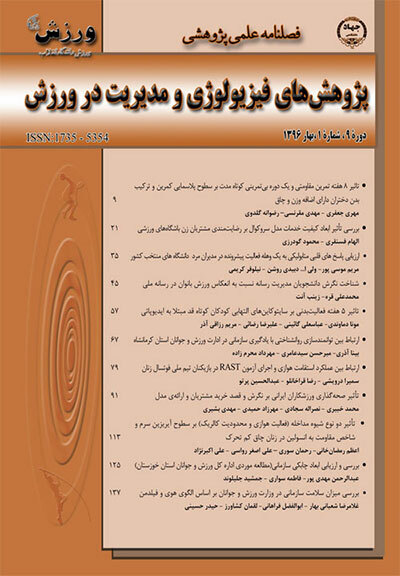 Bazgir, B., Rezazadeh Valojerdi, M., Rajabi, H., Fathi, R., Ojaghi, M., Emami Meybodi, MK., Gabriel, R., and et al. (2016) “Acute Cardiovascular and Hemodynamic Responses to Low Intensity Eccentric Resistance Exercise with Blood Flow Restriction”. Asian J Sports Med; 7(4): e38458. Neto, GR., Sousa, MS., Costa e Silva, GV., Gil, AL., Salles, BF., Novaes JS. (2016) “Acute resistance exercise with blood flow restriction effects on heart rate, double product, oxygen saturation and perceived exertion”. Clin Physiol Funct Imaging; 36(1):53–9. Veloso, J., Polito, MD., Riera, T., (2010). “Effects of Rest Interval between Exercise Sets on Blood Pressure after Resistance Exercises”. Arq Bras Cardiology: 482-87. Takarada, Y., Sato, Y., Ishii, N,. (2002). “Effects of resistance exercise combined with vascular occlusion on muscle function in athletes”. Eur J Appl Physiol; 86(5): 308-14. Thompson, PD., Franklin, BA., Balady, GJ., et al. (2007). “Exercise and acute cardiovascular events”. Circulation; 115(17): 2358-68.